At long last, some of our projects have been completed. Back in the beginning of March, I posted an update on the living room and master bedroom progress. The final touches on the living room have now been completed. Funny how those little things like putting the door handles on just never seem to get done. Livingroom – the big job in the living room was all the built-ins. There are 2 window seats, 3 bookcases, 20 cupboards, and 3 drawers. 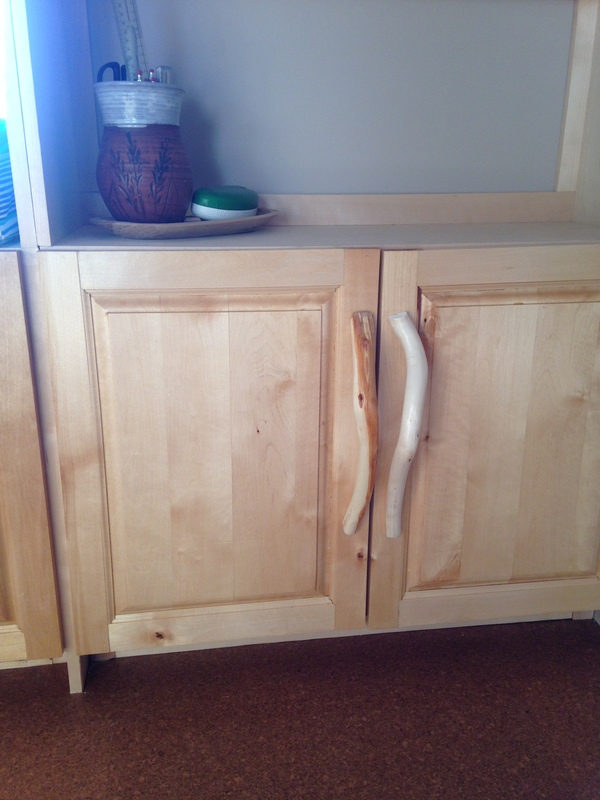 And after installing the doors on the cupboards, we decided that standard door pulls just did not do the doors justice and we went searching for our own ‘nature art’ door pulls. It was a bit more work, but I think the final product speaks for itself. Its is definitely a one of a kind room. Here is a close up of a couple of the doors. 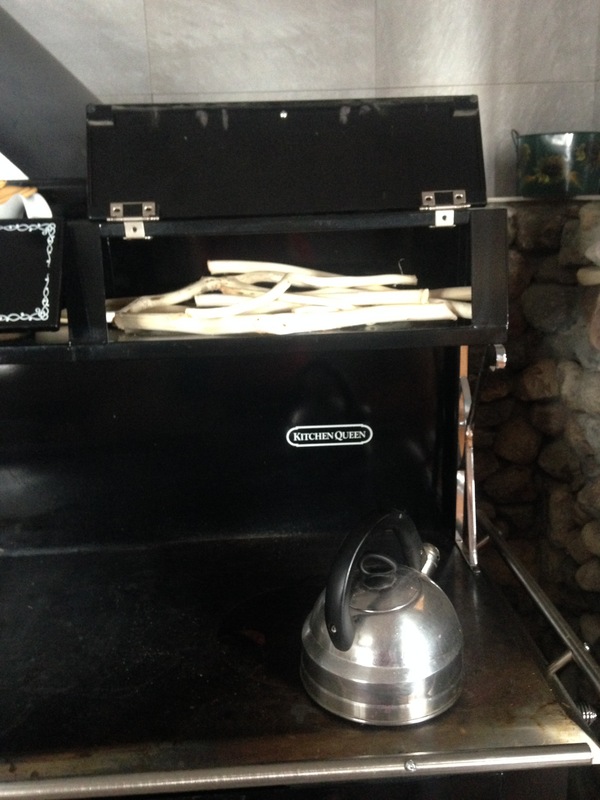 In order to speed up the drying of the handles, Ken made use of the warming ovens on the wood cookstove. I often use the warming ovens for dehydrating foods, and in this case, they made the perfect kiln for drying the twig handles. Above the window seats are two false fronts, on these we put ‘tree art’ we found in the bush. Finding the ‘tree art’ was an adventure. 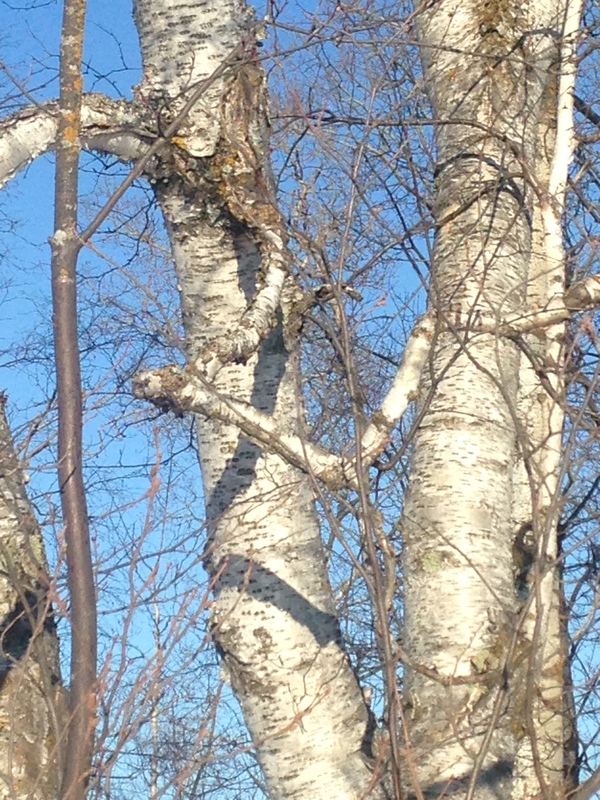 We tramped into the bush, carrying a ladder, looking for unusual shaped limbs. When I say we, I really mean Ken. 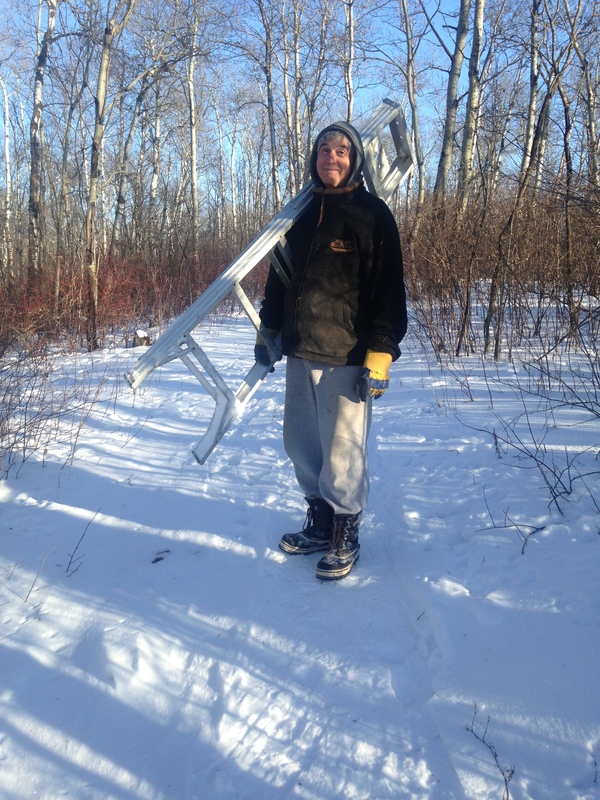 Carrying a ladder half a mile through snow is not something I am good at. 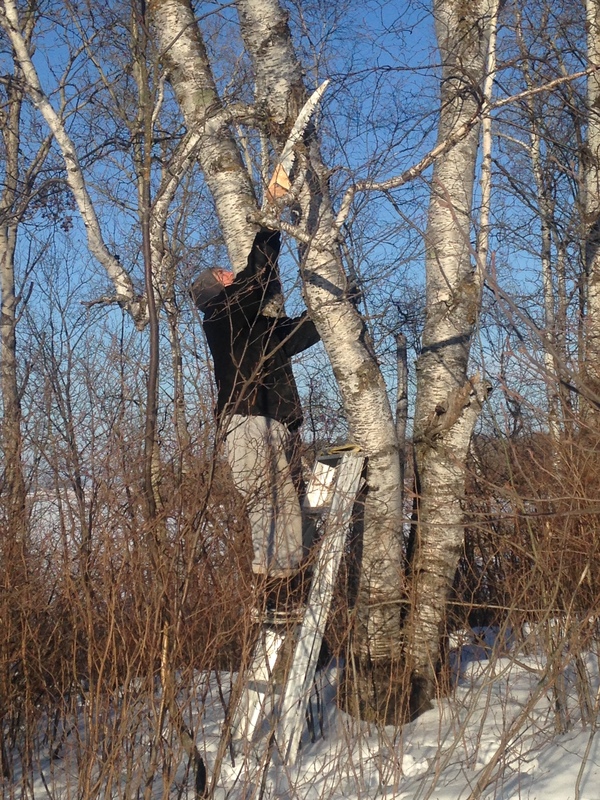 When you find that perfect specimen, you climb up and cut it down. Then you skin it, dry it and mount it. Included in the living room built-ins are cupboards and drawers built in the space under the stairs. 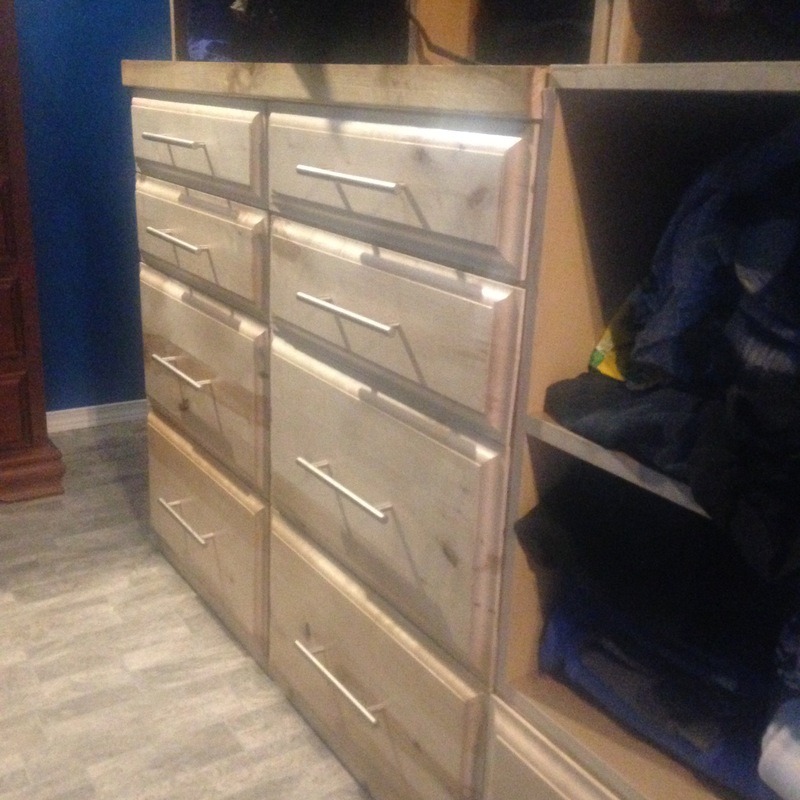 The drawers were finished a while ago but the last two door fronts are now done too. These were a bit tricky (Ken’s favorite expression. LOL) as they are odd shaped. But they turned out pretty awesome. 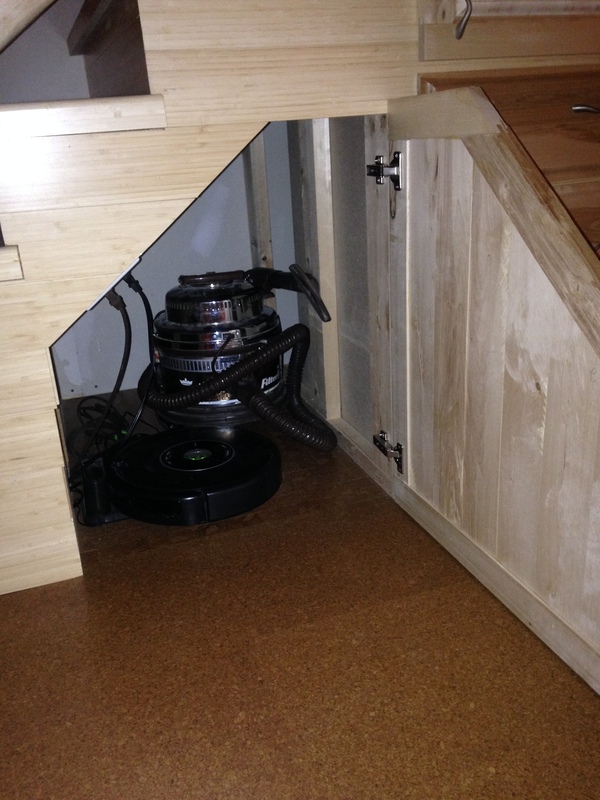 The bottom cupboard houses the vacuum cleaner and Rhoomba. We have no carpets in the house, but I find the vacuum really handy for cleaning off the mop head after mopping the floors. And the Rhoomba is awesome for cleaning the floors and door mats. I love letting it vacuum the floors while I go for a walk. 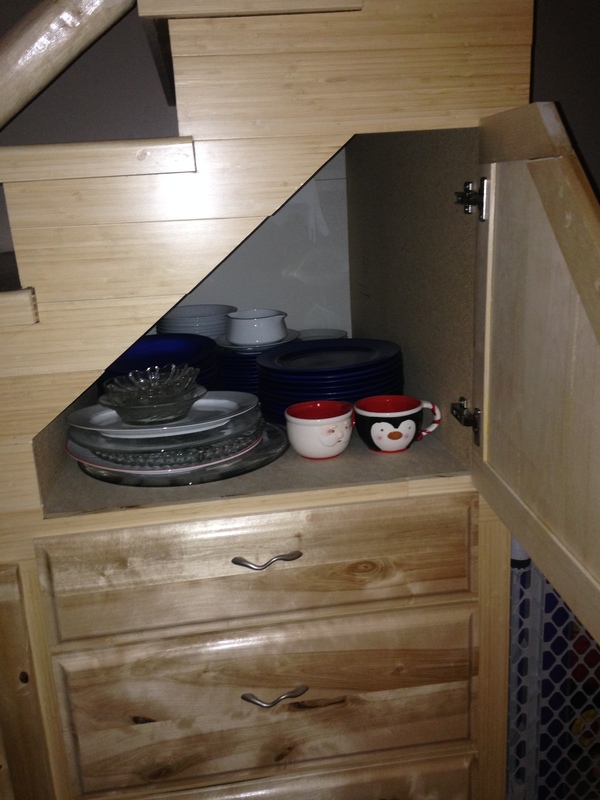 The other cupboard is used for dishes for the dining room, which is in the sunroom just to the right of the stairs. The drawers hold dining room linens, cups and glasses. The big alcove under the stairs currently houses a playpen full of kids toys. The original plan was to put Ken’s juke box in the space, but he still has not got it working after the move. At least when the kids come in June, the toys will be handy and the play pen will be used to block access to the stairs for the little ones. 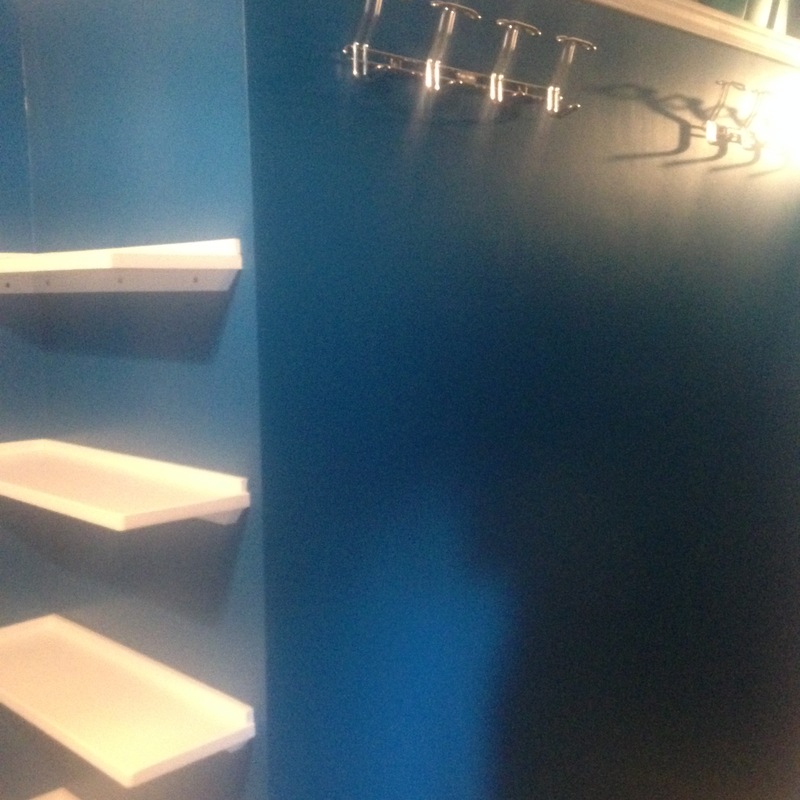 Walk-In Closet – Off the master bedroom upstairs is a walk-in closet, and it is all done. Wow, after two years my clothes are finally out of suitcases. The back of the closet has the hot water tank (located above the kitchen wood cookstove, which allows the stove to heat our domestic hot water and use thermosyphoning to circulate the hot water up into the hot water tank without using any electric power) and the stove chimney. The chimney is a Selkirk chimney and does not get hot to touch. You can see it above the closet unit in the picture. 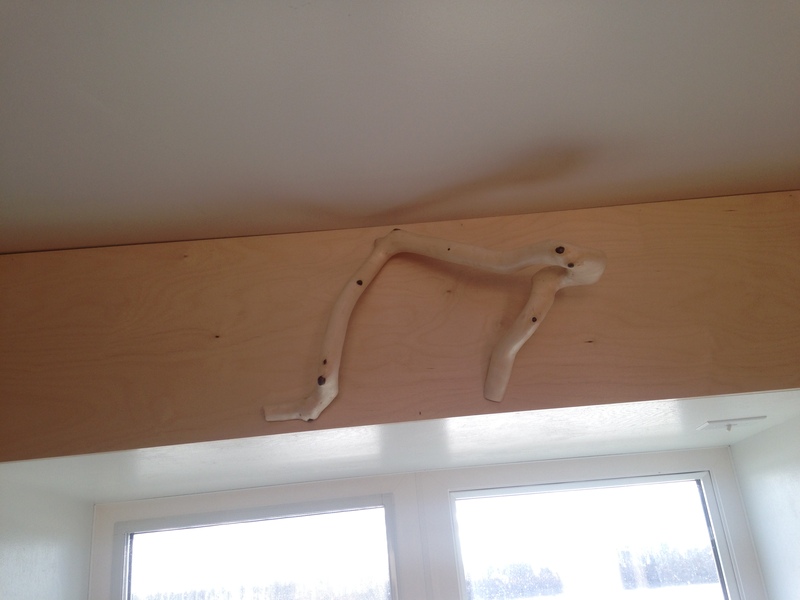 To make the best use of the space, we put in hooks on the wall to hang belts and stuff. 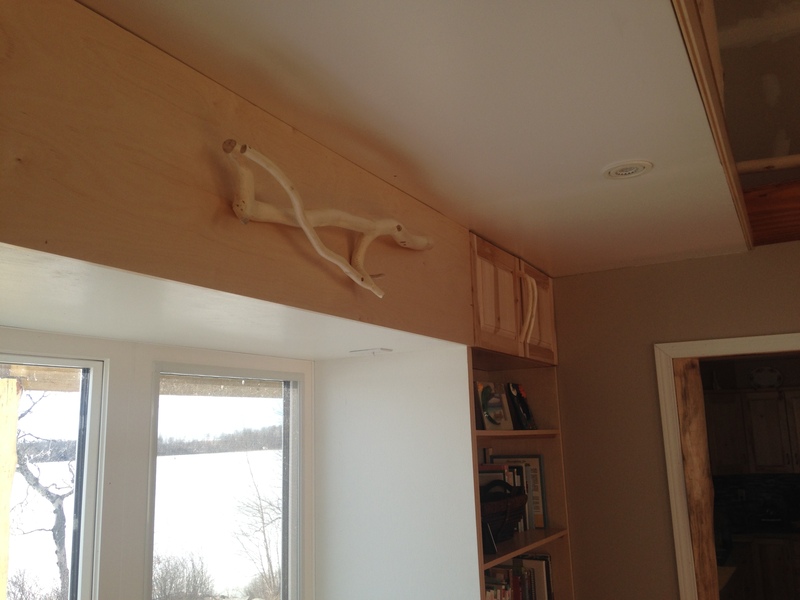 And beside the hot water tank and by the door to the bathroom, we put in extra shelves. 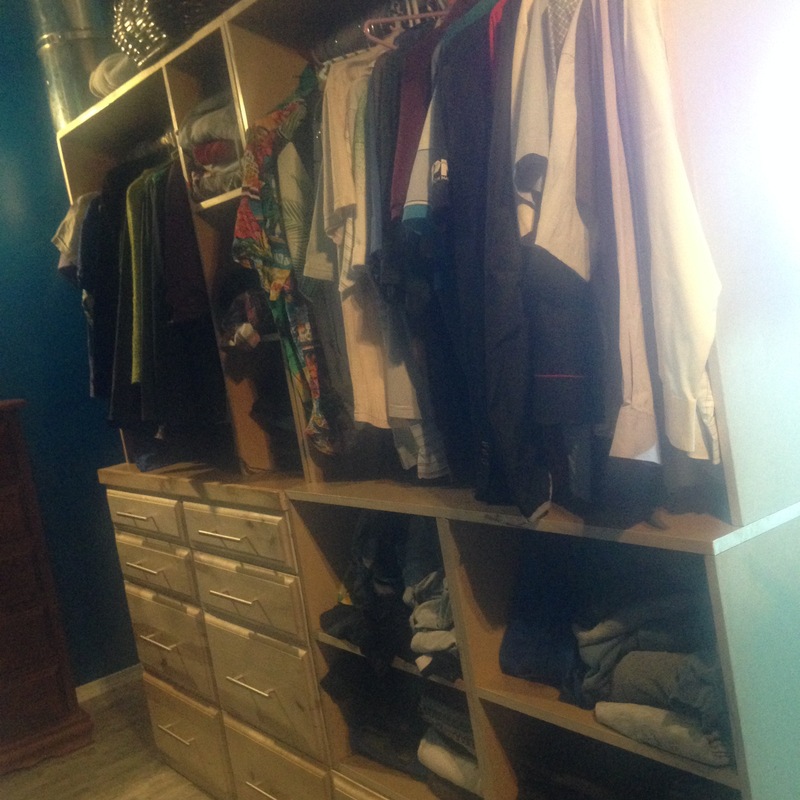 So nice to have the closet done. The master bedroom is also done, with all the trim put in and the doors installed. What’s next? 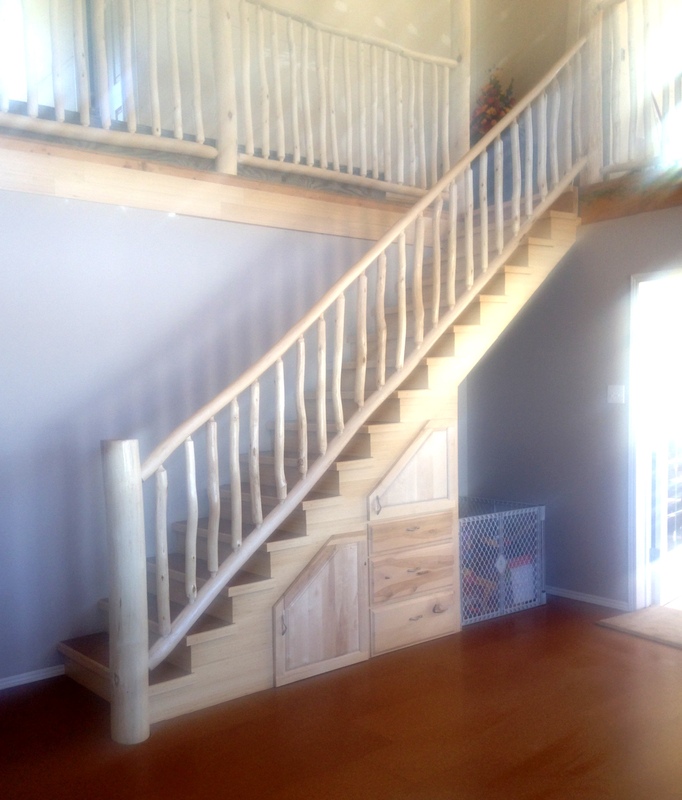 Right now Ken is taking a short break to go watch the Masters Tournament (golf) in Augusta Georgia, but when he returns next week we plan to get serious about finishing the bannister. And maybe putter at the master bathroom and the bookshelves for the small bedroom downstairs. However, spring has arrived in Manitoba so pretty soon the snow will be gone and once the yard dries up we will want to start with outdoor work. We will continue to putter away, but at least we are making progress. 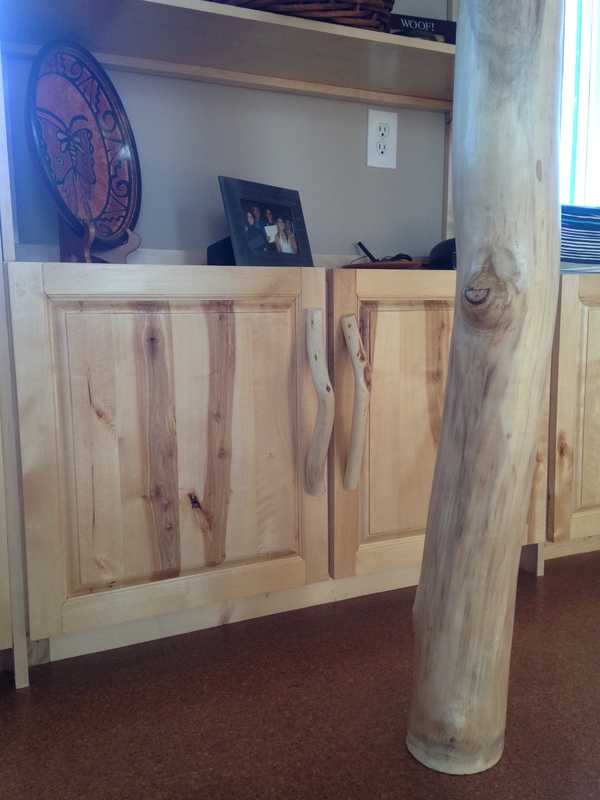 This entry was posted in Construction, Living Room, Woodworking projects and tagged cabinets, cupboards, livingroom, rustic, tree art, tree limb door handles, under stairs storage, walk-in closet. Bookmark the permalink. Your home looks beautiful !!! Thanks. We are enjoying it. Hope you drop by for a visit this summer.